In a medium bowl sift flour, baking powder, baking soda and salt. Set aside. To prepare cranberries, they can be either roughly chopped by hand or briefly pulsed in a food processor. Each berry needs to be at least halved (I don’t recommend halving them one by one—that takes forever!) but they shouldn’t be pulverized. 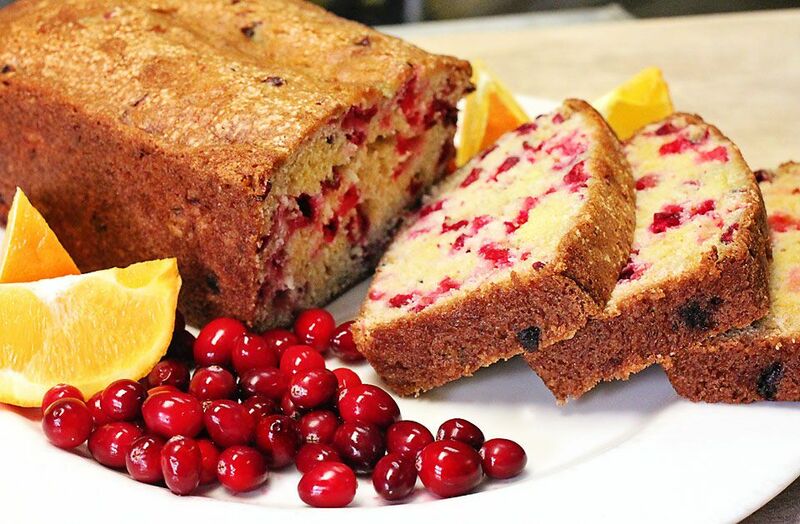 Once chopped in the way that you desire, set cranberries aside. In a second bowl whisk the fresh orange juice, orange zest and melted butter until well combined. Whisk in egg and sugar. Slowly blend sifted dry ingredients into wet ingredients. Mix thoroughly but gently. Gently fold in chopped cranberries. They need to be evenly distributed through the batter but don’t over-mix or your batter will turn pink! Pour into the prepared loaf pan. Bake at 350ºF for about an hour, turning the pan halfway through baking. A small knife blade inserted in the center of the loaf should have only a few wet crumbs on it. Allow the pan to cool for about fifteen minutes and then turn the loaf out onto a wire rack to finish cooling. Well wrapped, this loaf will keep for several days. Or, very-well-wrapped, it can be frozen for up to a month. Enjoy!